Chris OShea Motor Trimming commenced trading in 2002 and the business specialises in all aspects of classic car trimming and restoration work. 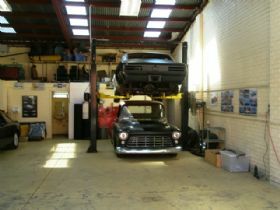 The workshop is located in Edgecombe Court, Moorabbin and is large, bright and clean and can hold up to ten cars comfortably. First impressions are important and if any classic car lover walked through the doors they would feel an instant affinity with this workshop. Most of the cars in the workshop have just been restored and trim is the final stage of most projects and really brings the car to life. There are a lot of great classic fifties and sixties cars including local and American muscle cars that are being fitted with new interiors. The proprietor, Chris OShea did his trade as a motor trimmer and has been perfecting his craft for twenty four years. He enjoys working on anything old and interesting and does mainly classic cars but he has retrimmed everything from a 1918 Dodge Tourer to modern Subaru WRXs and other Japanese imports. His motto is I do steering wheels to soft tops and everything in between. The services cover restoration, refurbishment and remake to concourse standards, original or updated interiors. All aspects of motor trimming are covered head liners, sun visors, door panels, arm rests, boot space, seats, consoles, soft tops, kick boards, parcel shelf, carpet and steering wheels. In consultation with a client Chris will scope out the desired end result and the materials to be used and he can provide an estimated time frame and quote. Chris has a number of Victorian suppliers that can provide a wide range of materials, vinyls and leather. Just about all the local and British vinyl, leather, hood cloth and carpet are readily available. If a customer requires original cloth that is not locally available a referral can be provided to allow the customer to source it themselves as sometimes this takes a long time to arrive. The same applies for original interior kits for American cars customers can source these and Chris will professionally install them. Chris can work with a bare seat frame and provide new padding and trim and if required by a client can also resculpt and reform the seats. He has cut down seats for clients requiring a certain look, modified the seat for comfort and made rear seats. Head liners can be trimmed to match the interior and there are multiple material choices for this and matching sun visors. All door panels are made of ply ensuring strength, fit and finish. Chris does a lot of work on convertible roofs and can do everything from fitting a readymade roof supplied by a customer to tailor making one for your car. With a readymade roof you are governed by how the roof was made but with a tailor made roof Chris can guarantee a perfect fit. The business has done a lot of roofs for MG, Healey, Porsche and Corvette owners and roofs can be made in vinyl or a range of cloth hooding materials. For clients interested in updating a classic interior there are a number of fabrication options the business can provide. If you have been to a car show lately you probably would have noticed some owners like to enclose part of the boot to hide the spare wheel, jack and battery or provide storage options. Others have added comfortable arm rests, hidden speakers, courtesy lights and consoles that never appeared in these classics when they left the factory. Working with the client Chris can provide all of these and depending upon the shape required he can fabricate whatever you require in ply, aluminium or MDF and trim it to suit. 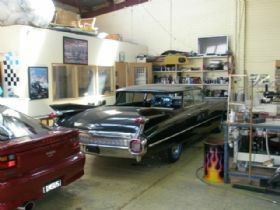 You only have to look around the shop to know that Chris is passionate about classic cars. He is in the hobby and owns a number of classics including a 35 Chev sedan delivery, 57 2 door post, 72 El Camino SS396 and a 68 427 Vette roadster. He is involved in the Chevrolet Car Club of Victoria and the Pontiac Club of Australia, Victoria branch. Chris chooses to work on his own which gives him ownership of everything there is no apprentice to blame. By doing it all himself from client consultation, fabrication and installation he can provide the level of skill, expertise and knowledge required to exceed a clients expectations. If you are looking for an outstanding motor trimmer for your classic, hot rod, custom, concourse or investment grade car Chris OShea Motor Trimming can provide a wide range of services based on your requirements. You can call Chris to arrange a time to see the impressive work he does during office hours which are 8 -5 Monday to Friday and Saturday by appointment.